I’m convinced that I’m some sort of unlucky charm for rain on race day. Both of my spring Halfs this year were rainy. Thankfully only one of them was a complete downpour. In all, I’ve run 4 of my 12 half marathons in the rain. I’ve killed an iPod. I learned the hard way that Sharpie runs when on a bib against a light colored tech tank and is rained on for 4 hours. I’ve learned how hard it is to fuel properly when you can’t tell if you’re sweating a ton. I’ve learned that there is rain and then there’s RAIN. In all of those learnings, though, I’ve learned some good things to keep in mind when you want to run outside, and it’s raining. Ziploc bags are your friends. You can buy expensive protectors for your phone… Or you can just put it in a ziploc bag. The snack sized ones are perfectly sized, and you can still control it, because the heat from your fingers gets through. Just don’t plan to take many pictures. Not ideal for pictures. Dress in as little as possible. Wet clothes are heavy. Heavy clothes aren’t fun to run in. Unless it’s a cold rain, dress minimally. If it’s cold, you’ll warm up quickly so opt for something water resistant but thin and breathable. For women, a tank and shorts or a running skirt in lightweight, quick dry materials is best. I’m a big fan of the Under Armour Fly Fast Shorts. They also have a waterproof pocket to keep your stuff dry. For tanks, my go to for rainy runs is the Under Armour Fly-By Stretch Mesh Tank. I love the X-Ray color, because it’s obnoxiously bright yellow, which is perfect for rainy days. The mesh back is great to keep you cool on s hot rainy run. Wool is not just for winter. Merino wool socks are your best friend for rainy runs. They’ll wick water away from your feet and help avoid blisters. Glide on. If it’s rainy, chances for chafing increase, lube up. Lube up everything. Take no chances. Follow your hydration plan. Drink as much as you normally would. You’re still sweating. Drinking less could result in dehydration and cramping. It’s even less fun than it sounds. Enjoy it. Go tech naked. Remember what’s fun about running. Be a kid and have fun with it. Just be careful, rain can be slippery. Be safe. Be bright, light, and aware. Rain makes it more difficult for cars or bikers to see, so make it impossible for them not to see you. Wear or take ID with you (as always) just in case. And know that running on paths or roads in the rain means they’ll be a little slick with grime for the first few hours of rain. Trails can quickly wash out in heavy rains, so be prepared if trail running in the rain. Running in the rain can change up a typical weekday run, or just remind you that it can be a lot of fun. But don’t forget to dry off and warm up quickly, and that you need to refuel as normal too! Do you like to run in the rain? Any tips I left off? So, so true! 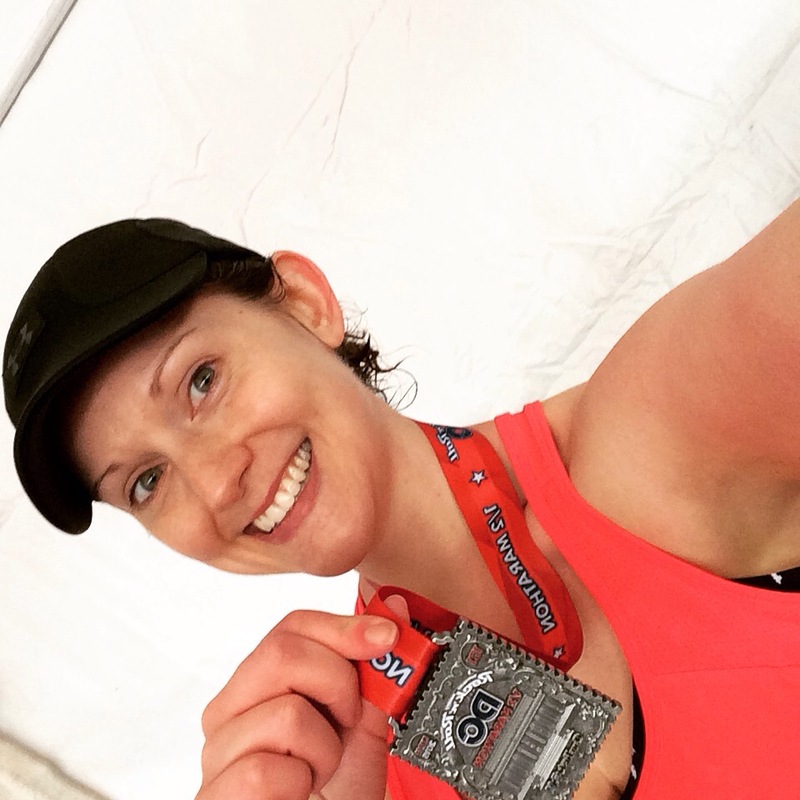 I ran my fastest half marathon in the craziest rain ever (I think I really just wanted it to be over) and my bib kept disintegrating and falling off and I had to stop to pin it on 4 times! I wore a rain jacket because it was cold out and it worked pretty well. I don’t usually like it, but it did make for a great half marathon time! It better not rain for our next half together!!!! I got a waterproofed iPod shuffle for my birthday after the rain in DC. I just got waterproof headphones to go with it. No more worrying about tech! Oh that’s awesome! And I hope not too! Ack! the rain and me don’t get along. Thankfully I have had no races in the rain because unlike my run days I can’t just quit and do it tomorrow lol. Great post though! I may have to refer back to it if I ever get to a race that continues no matter rain or shine. I go for Aquafor on my feet – totally prevents blisters even when you’re running for over 5 hours. I also double sandwich baggie my phone for extra security – in opposite directions. And wear a hat – when I see people not wearing a hat for rainy runs it always confuses me – the hat is key to keeping it out of your eyes. And enjoy it – running in the rain is usually pretty fun! I can’t believe I forgot the hat! Yes so key. Same for snow running! Oh my goodness, when I think of rainy races all I can think of is Wine & Dine last year! My only other tip would be the pre-race garbage bag. Mrs. Suter & I pride ourselves on our pre-race “Hefty Chic” and have designed whole outfits with garbage bags – my last one included a shirt & infinity scarf! Cheap, disposable and keeps you dry until you start running! Very good call! I’ve also put shopping bags over my shoes to keep them as dry as possible until start time! I don’t mind running in light misty rain, but I can’t handle anything more than that. If I’m sopping wet like that for a few hours, I always come down with a cold. This is great! How have I not read your blog before? The only thing I’d add is that stuffing your shoes with newspaper after a wet run really helps them dry out properly. It’s really been rainy this year!